Moroni (Arabic: موروني) is the capital of the Comoros. It is the largest city in the country. Moroni replaced Dzaoudzi as the capital in 1962. The city has a population of about 60,200 people. 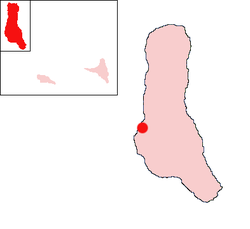 The city is located on the western coast of Grande Comore island. Moroni is served by the Prince Said Ibrahim International Airport. There is also a harbour which has ship which go between the African mainland and the islands in the Comoros archipelago, as well as Madagascar and other Indian ocean islands. This page was last changed on 15 November 2018, at 06:39.